Ideally, I would say all one needs to do with regards any new masters of both releases - the Star Wars OT and The Matrix - is simply match them to the original theatrical release prints... but those original theatrical prints often varied quite differently in overall tonality and color, depending on country and territory... so which one is the 'correct' one? The director makes a call and you end up with gently-tinted blue walls on the Tantive IV which were clearly white in the film released just a couple years before. Or a green tint on the first movie of a trilogy that wasn't originally there to match the other two. Or a green tint on the Blu-ray of the first movie of a trilogy that's still not there on the other two Blu-ray releases. enro99 and Plan9 like this. New plan. Let’s spend the next 35 pages coming up with a new story and movie entirely! If we can work together, we can make something amazing! But then I keep coming back to this, as @Vidiot pointed out it can all be subjective where you land, even with reference.. And even on those sets I mentioned above, the films that were rescanned from film do have a similar look to them, even though they were shot by different DPs. I dunno. I would say Force Awakens, Rogue One, Solo, and Mission: Impossible all had vastly different looks. Force Awakens was shot on film and color-timed by Stefan Sonnenfeld at CO3/Santa Monica; Rogue One was shot on Alexa 65 and color-timed by Shane Harris at CO3; Solo was shot on Alexa 65 and color-timed by Joe Gawler at Harbor Pictures/Santa Monica; Mission Impossible was shot on Panavision DXL (Red Helium) and color-timed by Asa Shoul at Molinare/London. To me, they're all very different. If you mean Star Wars Episodes 4-5-6, those were all shot on film, scanned at Post Group, and color-corrected at ILM in C Building in late-2003 to about April 2004 by myself, Rich Garibaldi, and Natasha Leonett. The only common factor is the producer/director supervised them all, on the same monitor and the same color system (Pandora Pogle Platinum and a Quantel iQ for image source). To me, each one is quite a bit different in terms of art direction, lighting, and exposure. Star Wars was definitely the hardest, because the film was falling apart. For me, they never pulled out the prior transfers and had us reference them: we were told, "George never approved the 1980s/1990s home video versions, so we'd rather start with a clean slate." supermd, coffeetime, Old Rusty and 2 others like this. Sorry, I think I should have clarified, I don't think there is a single film in the Disney Wars set that looks similar. I meant for the new 4K masters of Harry Potter, Harry Potter 1 and Harry Potter 2 (which were the only two films assembled photochemically, then rescanned) looked pretty similar with the new Peter Doyle grade, at least more similar to each other than any other film in the set. Same with M:I 1 and M:I 2 vs the rest of the set. AFAIK rest of the films in those franchises were DIs, digitally colored from the get-go, and the new HDR grades follow the DI pretty closely, while the "4k" image was a blow-up from the 2K master. Obviously major changes in those scanned films in composition lighting etc, but no huge changes in color temp, or contrast. To my (untrained) eyes the remastered OT Star Wars films pretty consistent in these aspects as well. They have a shared color look that is not present on the HD master of Episode I or the digital coloring of Episode II and III. I can say we did occasionally pull up shots from Episode 6 to use for Episode 1. One thing they didn't ask for but I did do was to make the end credits the exact same shade of pale blue for Star Wars and Return of the Jedi, and George was very appreciative. I think that was the first time that both the yellow crawl at the head and the blue credits at the end were identical in terms of look. Getting stuff like this right is the kind of detail we try to do, and it's easy to screw up. Bowie Fett, chilinvilin, scobb and 2 others like this. I can say we did occasionally pull up shots from Episode 6 to use for Episode 1. By Episode 1, do you mean you worked on Phantom Menace as well? Whoops, I meant comparing Episode 6 to Episode 4. We did have a moment at the end of Jedi where Lucas noticed the Emporer using "lightning" to try to kill Luke Skywalker, and he had me export some frames so that they could match that effect in Episode 3. That is a case where they actually went to the trouble of making the 2005 film look reasonably close to the 1983 film. supermd, zombiemodernist, coffeetime and 1 other person like this. "When I began watching Star Wars, from the moment I saw C-3PO and R2-D2 on the blockade-runner I knew something was amiss; something didn’t feel right. I kept watching with an odd, unbalanced feeling in my stomach, and it wasn’t until the story cut to Tatooine that I realized the cause: this was not the Star Wars I knew. 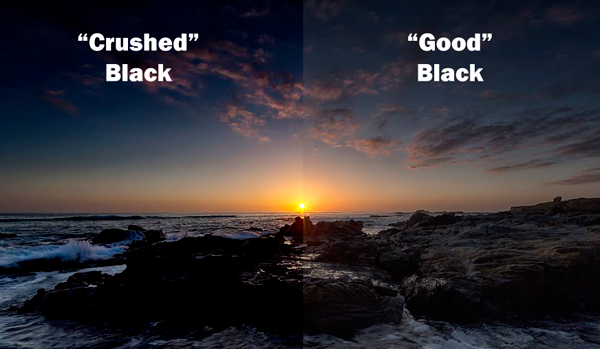 A new color pass has been done, and the soft (nearly flashed), pastel color palette created by Gilbert Taylor, BSC has been replaced by very sharp, high-contrast, super-saturated imagery. The blues were nearly popping off my screen, and the blacks were so crushed that in certain scenes — especially those that take place in the Sandcrawler — the image was losing significant detail. The over-saturated blues have also washed out a lot of sky detail and appear to have negated some ND grads that appeared in the original photography. Taylor’s photography on Star Wars was part of what made it unique — the picture didn’t have the sharp, high-contrast, snappy look of most fantasy films. Like John Barry’s inspired production design, which looks aged and worn, Taylor’s desaturated palette and use of nets created a muted, somewhat tattered look that helped ground the story in reality. With this new transfer, that look has been completely destroyed. The new color timing does, however, make Star Wars more closely resemble the other five films in the series, especially the latter ones shot by David Tattersall, BSC. Nevertheless, this change was jolting." No ********, just the plain facts! DrDre and Freelance_Philosopher like this. That's cool. Revenge of the Sith did try to reconcile the mise-en-scène of the OT with the PT more than Menance or Clones did. Can someone explain what "crushed blacks" are to a novice like me? Basically, they are dark areas in film that are further darkened to the point that those areas lose the detail that was once there. 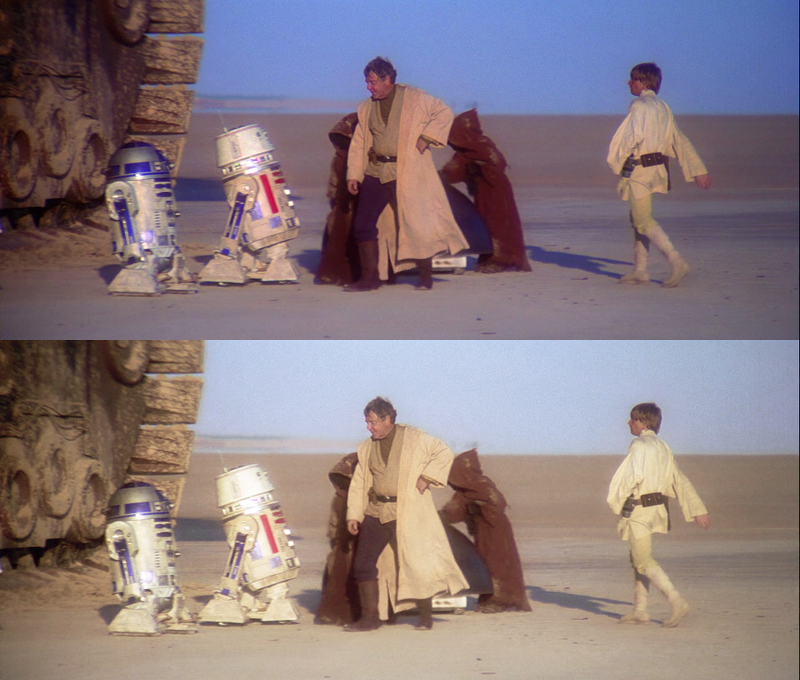 You see this quite a bit in the 2004 DVD and 2011 Blu-ray of A New Hope. coffeetime, budwhite, JediJoker and 3 others like this. To me, a lot of it boils down to checking the scopes and making sure we're not cramming the blacks right into the "0" level at the bottom of the signal. In the case of cinema images, we look for subtle details in the black areas, like wrinkles in costumes, stitching in fabric, texture in the backgrounds, stuff like that. Be warned there are screen grabs out there on the web that do not tell you the truth (aka "fake news"). As I explained in previous messages, there is an issue called "Full vs. Video levels" that can affect how images are pulled off of Blu-rays. Monitor setup is also critical, because the image source might be fine, but your monitor itself could be crushing black detail. Gamma settings are also critical; we tend to use 2.4 gamma in mastering, but theaters are at 2.6 and computer displays are at 2.2, so all three have slightly different contrast levels. In the color bars above, you should be able to just barely see the grayer-than-black pulse in the lower right, which is the PLUGE (picture lineup generating equipment) pulse. ggergm, BGLeduc, coffeetime and 4 others like this. Or maybe he is just avoiding that situation where you criticise your boss in the internet and then, well, **** happens, right? Well, I was just a hired gun, or (to mix my metaphors) just the guy driving the bus. It wasn't my decision where we were going to go or how fast we should drive: Mr. Lucas controlled the gas pedal and the brakes, and he told me where to steer. And he owned the bus -- it was not my bus. supermd, ggergm, BeatleJWOL and 11 others like this. Something I've wondered for a lot of time is why Return Of The Jedi has always looked so bad, lacking definition and having kind of a fuzzy picture. The Empire Strikes Back looks with good definition (even on Laser Disc) and seems not to use the difussion lenses used on Star Wars, but the issue with Return Of The Jedi is different, its picture is not clear, lacking a better word (English is not my mother languaje) it looks weird. Maybe Vidiot has seen the OCN or a first gen IP and can tell us howit looks. Something I've wondered for a lot of time is why Return Of The Jedi has always looked so bad, lacking definition and having kind of a fuzzy picture. The Empire Strikes Back looks with good definition (even on Laser Disc) and seems not to use the difussion lenses used on Star Wars, but the issue with Return Of The Jedi is different, its picture is not clear, lacking a better word (English is not my mother language) it looks weird. Maybe Vidiot has seen the OCN or a first gen IP and can tell us how it looks. I'll say this: Return of the Jedi was a lot sharper than the original Star Wars, because they didn't use nearly as much diffusion on the lenses during the 1982 production. The Lowry Process used to de-grain, stabilize, and repair the image also has a sharpening kernel at the very end of the pipeline, so they did sharpen all three films on a frequency-selective basis (meaning they didn't sharpen the whole picture, just parts of it). I have said many times here that 1970s and 1980s anamorphic Panavision films are not sharp, period. The lenses don't help and the Kodak emulsions of that period weren't sharp enough to resolve a lot of detail compared to the films of the last 25 years. But absolutely, a new scan could be done much better today. How much better is a subjective call. supermd, chilinvilin, BGLeduc and 3 others like this. I wish they had used pin-registered scanners for the project, but instead a real-time Spirit 2K was used for time & scheduling reasons. Can you explain what this Machine is / the alternative? I've seen the Spirit or Sprit 4K listed as a source in a lot of Criterion BRs that often look pretty good. But I have also heard telecine are not the best way to scan film. I remember a lot of people were upset about the Pulp Fiction disc using a Tarantino approved telecine, but I still don't fully get the difference. The Spirit scans film in real time: a 20-minute film reel gets scanned in 20 minutes. 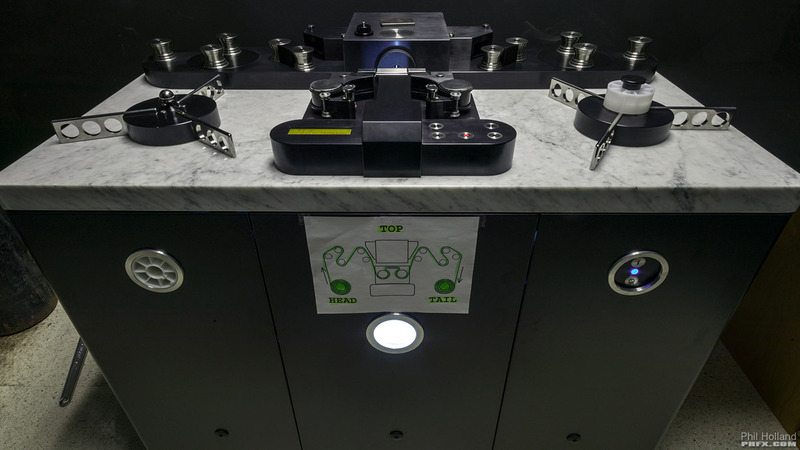 The Arri Scan device moves at roughly 4fps, but it has a special pin-registered gate that holds the film very precisely in position, and it takes about 4 hours to do one roll of film (instead of 20 minutes). If you get two exposures off the film -- one optimized for highlights, one optimized for lowlights -- and then average the exposure inbetween (an HDR scan), it takes about 50% longer. That's what I wish they had done for Star Wars. Both the Arri and the Northlight are very similar in terms of picture quality: both pin-registered, both use CCD pickups, both take a long time to scan film, and both cost somewhere north of $500K or so. The Spirits were actually more costly back in the day, but are now much cheaper. For really high-quality archival scanning, the Arri, the Northlight, or the newer DFT Scannity all can do good jobs. There are some pretty bad scanners out there. zombiemodernist, Kiko1974, coffeetime and 5 others like this. Thanks for the explanation! Out of curiosity, is there a standard choice to transfer modern movies shot on film to digital files for editing? I’m assuming the pin-registered scanners would be preferred but slow transfer seems a bit painful for unedited content. 2) assign multiple people to scan all film at maximum resolution and get it all done in 10-12 hours. That way, it's all scanned at one time and you don't have to go back and do it again. There's pros and cons for each approach. For huge massive big-budget films, I think they generally do #1. Kiko1974, JediJoker and zombiemodernist like this. On case #1, why only re-scan selected shots at higher resolution and not the full film? For big budget movies wouldn't make more sense to do it as case #2? Costs too much and takes too much time. They only re-scan the actual shots that wound up in the finished film. Bear in mind there are movies out there that shoot 400-500 hours of shots, only to wind up with 2.5 hours of material in the finished film. JediJoker and zombiemodernist like this. In this case I adjusted the image not by matching it to a reference, but by first balancing the frame to get rid of the blue shadows of the bluray frame (a clear undesired side effect of the push in blue), subsequently increase the brightness, whilst reducing contrast, and finally reduce saturation. This to me is the look that's more faithful to Taylor’s original desaturated palette as suggested in the review, and also matches the 1977 and 1997 print references. Having just watched 4K83 in UHD format, it was a bit startling how good it looks not just in terms of resolution, but also color. Perhaps my memory is playing tricks with me, but it FEELS closer to how I remember Return of the Jedi in the theater 35+ years ago than anything else since. I would much prefer a proper home video release for the original trilogy films — certainly I would prefer to buy them rather than having to download unauthorized versions. I don’t want Verta’s “Legacy Edition” of Star Wars as an official release and don’t see that happening at all. I want a proper restoration that has been worked on by a team of professionals who are working with the original source. Vidiot, Robert C, BeatleJWOL and 1 other person like this. I would like to see the best possible restoration of the originals faithful to the original look of the film. If it's Verta's work, that's fine, if it's a restoration directly from the negative, that's also fine. Considering the fact that a team of professionals working from the original source hasn't been a guarantee for the best quality in the past, I don't see why a restoration that has been worked on by a new team of professionals should be the automatic preferred option, even if they should have a clear advantage on paper. The reality is, that faithful restorations like the Godfather 4K restoration from a few years back are more the exception than the rule. Now if Disney were to put a veteran like Robert A. Harris on the job (who has offered to do the job to Lucas in the past), that would certainly get me excited for an official restoration from the original source materials. Encuentro and JediJoker like this.